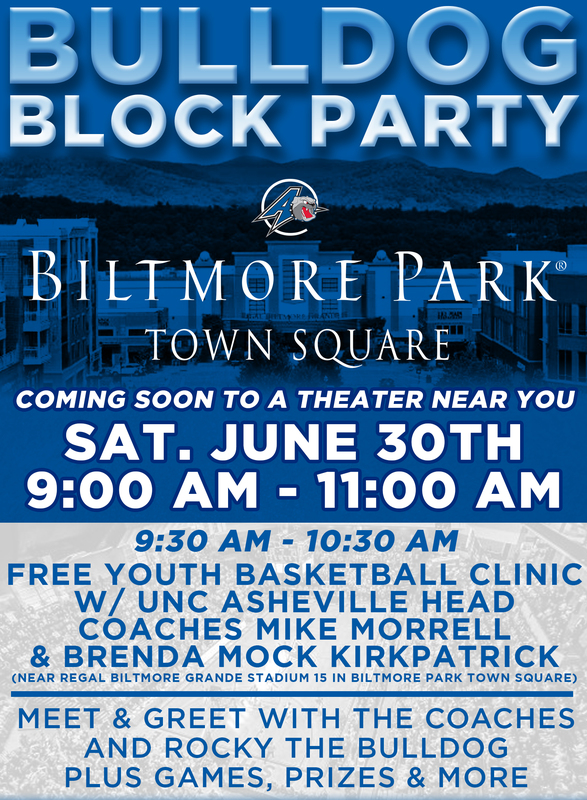 ASHEVILLE, N.C. – UNC Asheville athletics invites all from the Asheville area to a special Bulldog Block Party at Biltmore Park Town Square on Saturday, June 30. The Bulldog Block Party at Biltmore Park Town Square on Saturday, June 30, will run from 9 a.m. until 11 a.m. The event will specifically be located near the Regal Biltmore Park Grande Stadium 15 & RPX Movie Theatre and in Cecil Park, which is the green space area near Hickory Tavern and Brixx Wood Fired Pizza. The special morning filled with fun will feature a meet and greet with UNC Asheville coaches along with Rocky the Bulldog. There will also be games, prizes and much more! In addition, UNC Asheville men's and women's basketball head coaches Mike Morrell and Brenda Mock Kirkpatrick from 9:30-10:30 a.m. will hold a short youth clinic for all children in attendance. All of this is just the beginning as well. There will also be plenty of surprises on the day of the event! To learn more about UNC Asheville athletics visit uncabulldogs.com.